Volkswagen unveiled a concept car called the Beetle Dune at the Detroit auo show on Moday. The concept is a variant on its iconic car that evokes the Beetle-based dune buggies favored by tuners in the 1960s. It's a revival of a concept that VW showed at the Los Angeles auto show in 2000, which was never built. Likewise, some people might say this one is just eye candy for the auto show crowd. But that may not be the case. And here's why. VW builds the Beetle in Puebla, Mexico, on its old PQ35 platform, the same platform that underpins the current Jetta and Passat. That platform has already reached the end of its life. Most of VW's new models will be on the MQB modular tool kit, starting with the next-generation Golf hatchback; production starts this week, beginning the Puebla plant's transition to the new breed of cars. Yet the Beetle was launched in 2012; it probably will be sold through at least 2018, long after Volkswagen Group has switched most of its volume cars to MQB as part of a platform sharing strategy. 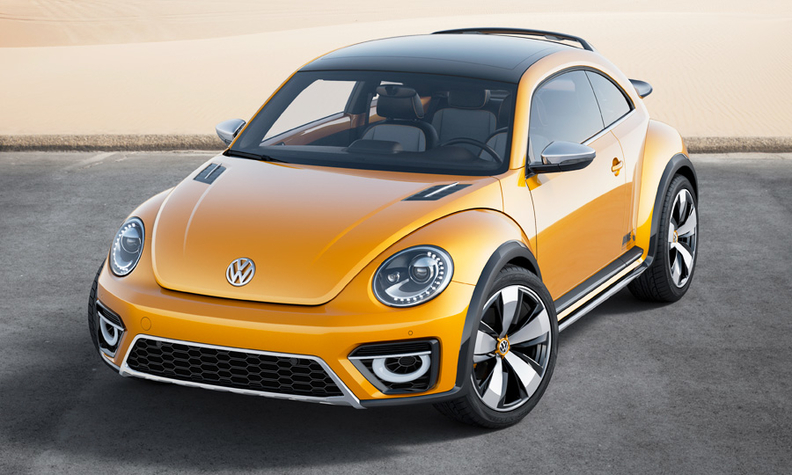 Even though VW took pains to make sure the two platforms would be mostly compatible, going from one generation to the next takes a sizable investment in retooling -- one that might be hard to justify for the Beetle, which is a relatively low-volume car on a global basis. Looking ahead a few years, VW may find that cranking out variants like the Dune to prop up sales of the aging Beetle is a wiser investment than retooling the plant to build new cars. "While the concept car shown in California was not very realistic, especially with its interior and roof structure, the 2014 Dune Concept is a lot more feasible," VW said in a statement.